2012 was a very lucky year for 888Casino players with more than $3,800,000,000 paid out to winners. Every 28 minutes a jackpot is hit on 888 Casino with an average of 50 jackpots won daily. 2013 will also be a great year especially since 888 Casino have kick started the year with a special promotion where players can get more than £/€/$800 in FreePlay to play the latest online casino games. There was more than $3,800,000,000 won on 888Casino in 2012 certainly a very lucky year for players. 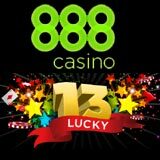 888Casino have labeled 2013 as Lucky 13 and predict an ever better year as the rapidly expanding online casino plans to offer bigger and better promotions. To start the year they have added a special promo where players can get up to £/€/$800 in FreePlay bonuses to play their most popular online casino games. The promotion runs until the 13th February 2013 and offers players £/€/$13 in FreePlay when depositing £/€/$20 or more using the 888 Casino promotion code. 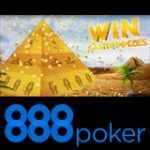 Once players have completed their first deposit bonus they can claim the 888 Casino FreePlay bonus every time they deposit thereafter. Simply deposit £/€/$20 or more using one of the 888 Casino promotion codes to claim that bonus, players can use each of the FreePlay promotion codes up to 13 times totaling up to £/€/$800 in FreePlay bonuses. This offer is only available to players who have already made their first deposit. The FreePlay promotion is perfect for those players looking for an 888 Casino reload bonus, take advantage of this offer by reloading your account before the 13th February 2013. Make sure you read the 888casino bonus policy terms and understand the wagering requirements before depositing. Bonuses will be granted within 72 hours of completing the wagering requirements. FreePlay bonuses must be used within 14 days of issue. FreePlay winnings will become available when players have completed their FreePlay. 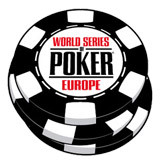 Players must then wager 30 times the FreePlay winnings before they can withdraw their winnings. Over 5,000 jackpot winners, almost $20,000,000 paid out in 17,000 jackpot wins. That's 50 jackpots won everyday with an average of 1 jackpot hit every 28 minutes. Luckiest skill game: Blackjack, which paid out a half a billion dollars. Luckiest player won $1,556,908.70 playing Ultimate Grill Thrills. Luckiest Day: Friday, players won more than $490,000,000 when playing on Fridays. 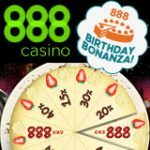 888 Casino also celebrated 15 years in the gaming industry, reassuring players that the brand is one of the most establish and trusted online casinos. 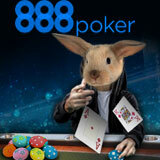 More than 600,000 new players signed up to 888 Casino in 2012. 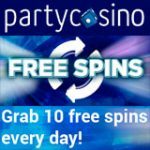 888Casino offered more than 250 casino promotions which include free prizes, bonuses, free spins and FreePlay. 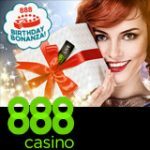 The most popular 888 Casino promotion was the £88 free promo which offered free bonuses to more than 200,000 UK players. Live Dealer Casino games offering Blackjack, Roulette and Baccarat. 31 new online casino games which include: A Nightmare on Elm Street, Clash of the Titans, Dawn of the Dinosaurs and Cafe de Paris. 10 new mobile apps which allow players to play casino games on Android or IOS devices. For more information see - 888 Casino Android App. 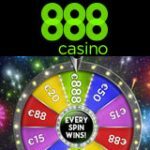 888Casino is also sponsored several events including: ATP Tennis, Euro 2012 football, Fontwell Racing, Grand Prix Italy & Silverstone. Olympic Basketball, Olympic Volleyball England v Australia Rugby, Six Nations Rugby, Snooker Welsh Open, UK Golf Open and live concerts by The Rolling Stones and Tom Jones.